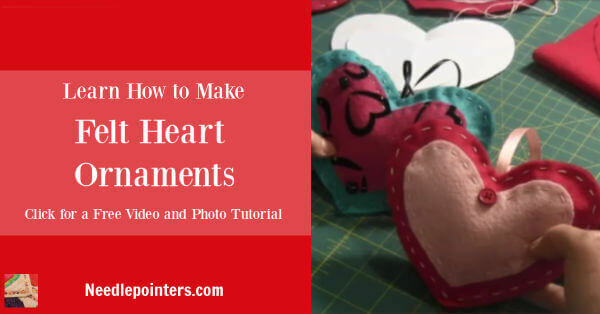 Learn how to make heart ornaments from felt. This is a fun, cute and simple project even kid's can do. Click to watch the Heart Ornaments (Felt Project) - Valentine's Day Craft video in Youtube. * Fold a piece of paper in half. * Draw half a heart on the paper and cut it out. * Cut a second heart out of paper the exact same size. * Now, cut the second heart smaller. It should be about 1/4" to 1/2" smaller all the way around. * You have two hearts, one larger and one smaller. * Place the larger heart template on a piece of felt and trace around it. Cut two larger hearts from the felt. To make it easier, you can fold the felt and cut two hearts at the same time. * Place the smaller heart template on a piece of felt, trace around it and cut out one heart. * Take the smaller felt heart and put on top of one of the larger felt hearts and pin in place. * Thread a needle with six-strands of embroidery floss, attach the smaller heart to the larger heart using a running stitch close to the edge of the smaller heart. * Optional: If you would like to add some embellishments, such as buttons and beads to the ornament, you would do it now. * Put the two large hearts together. * Cut a pieces of ribbon, fold in half and pin it between the two hearts at the top. This ribbon will be used to hang the ornament. * Start stitching the hearts together. Beginning on the side of the heart, with embroidery floss stitch close to edge with a running stitch. Stitch all the way around making sure to secure the ribbon in place with a small stitch and leaving a 2" to 2 1/2" opening on the side. This opening will be used to put polyfil inside the ornament. * Insert polyfil stuffing through the opening, putting as much or as little as you want. 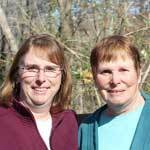 * Close the opening using a running stitch.